When you think of Ireland, do you have romantic visions of manor houses and castles, steeped in history surrounded by lush green lands? In our minds that was our vision of Ireland. 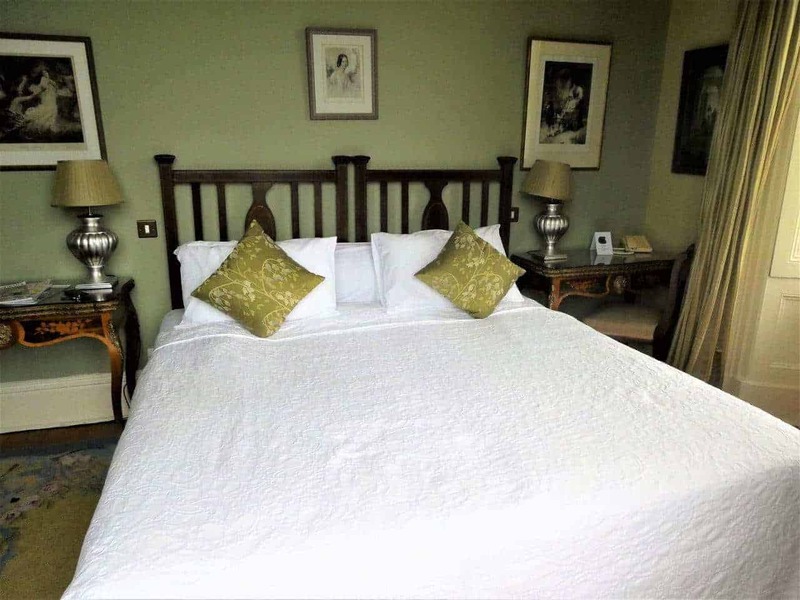 When we first decide to go to Ireland, we agreed that we were going to immerse ourselves in the romantic side of Ireland by staying in some castles or manor houses. Think Downton Abbey. Above all, we wanted to experience the romance of a bygone lifestyle. Consequently, in our search, we found Ireland’s Blue Book. 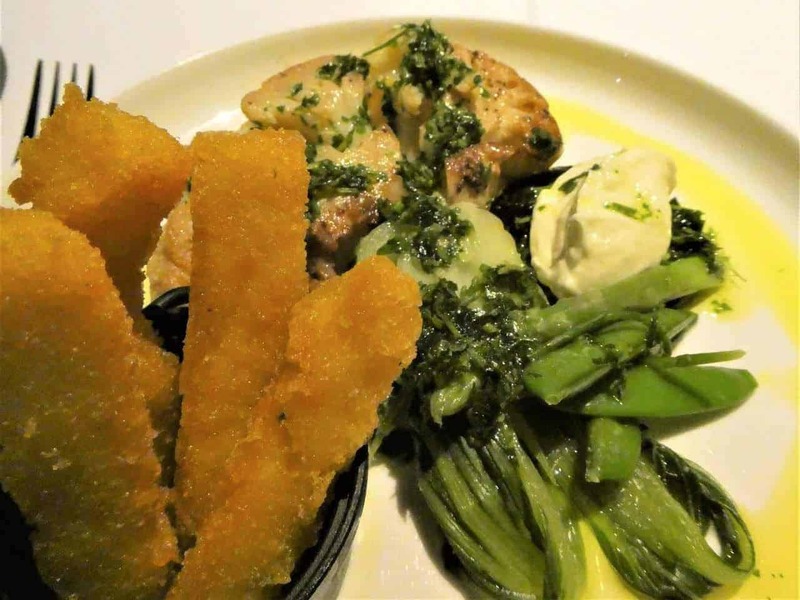 They are an association of some of Ireland’s finest castles and country homes with wonderful award-winning restaurants. 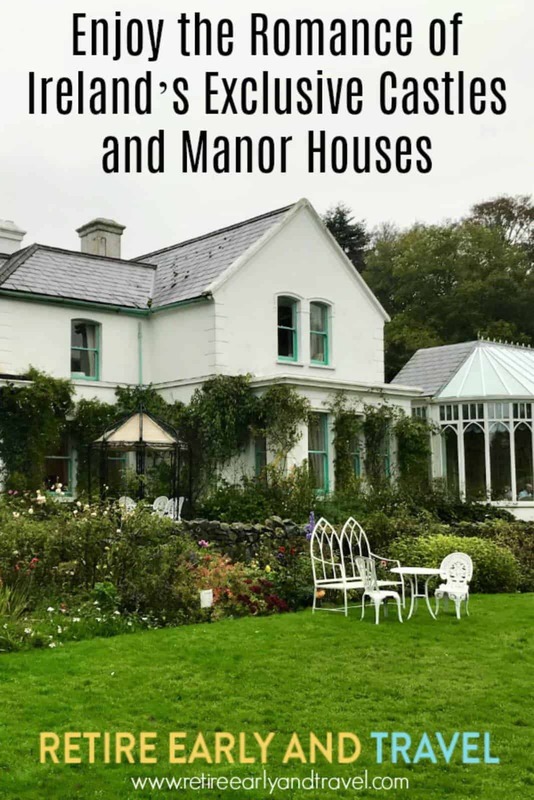 We decided that we would experience Ireland for a week by staying in these manor homes. Thus giving us that “once upon a time” experience. The castles and homes we visited were not just beautiful, but old dwellings layered with history. In addition, they sat on scenic grounds and boasted uninterrupted gorgeous views. Situated in isolated countrysides is where we found most of our stays. 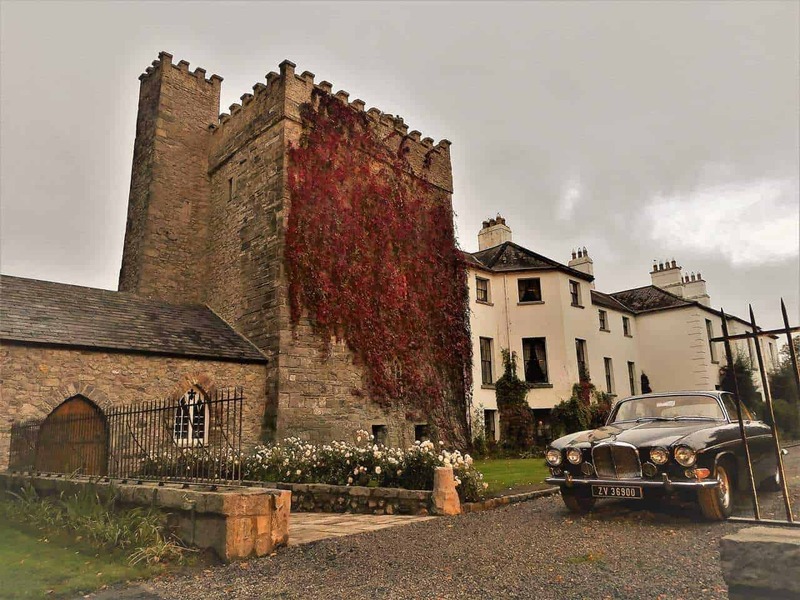 Our first stay was at Barberstown Castle, originally built in 1288 and converted to a hotel in the late twentieth century. Driving up the long driveway was spectacular. 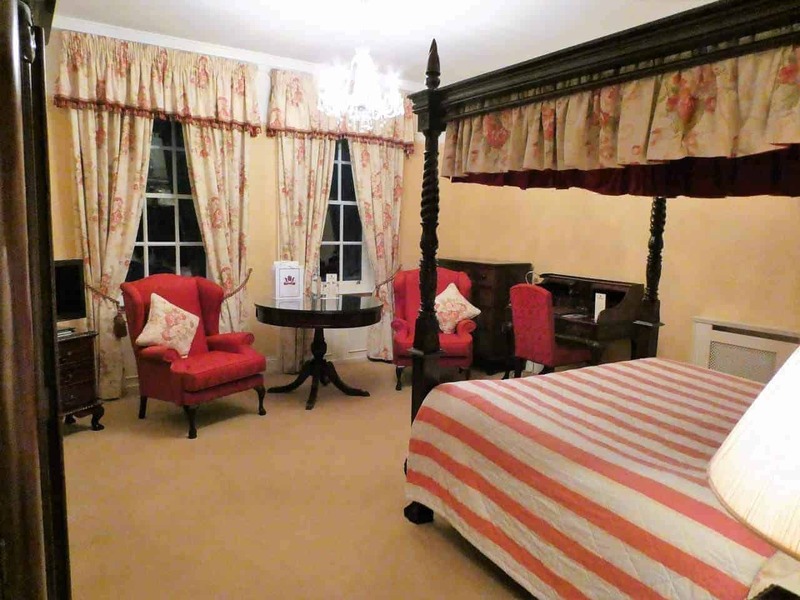 Barberstown Castle is a luxurious Kildare hotel. It has had many distinguished owners, one of whom was Eric Clapton in the 1970’s. Consequently, the name of each guest room in the castle is that of a previous owner. 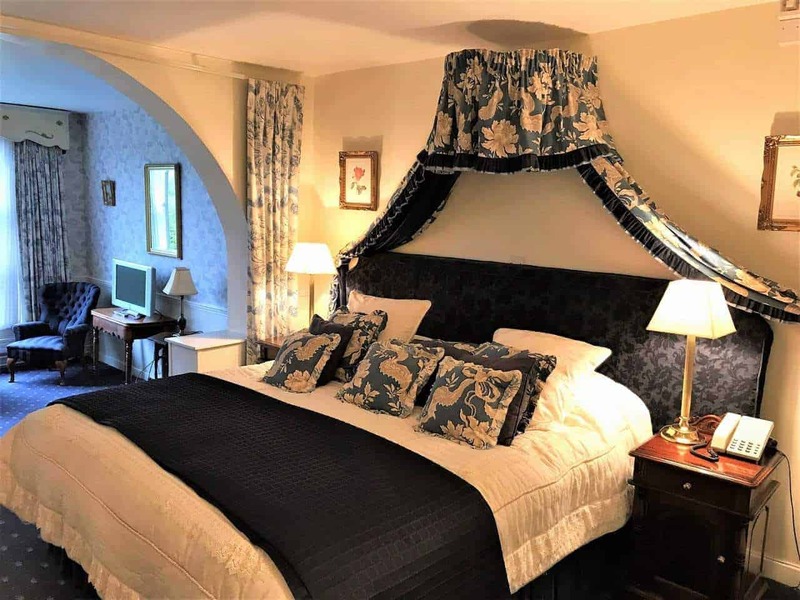 Located just 25 minutes from Dublin and in the heart of Ireland’s Ancient East, this Irish Castle is a perfect getaway. Sunrise over the beautiful gardens of this elegant castle is a must see. Our room decorated and luxuriously appointed with beautiful antique furniture was a junior suite. It featured a four-poster bed with a comfortable seating area. 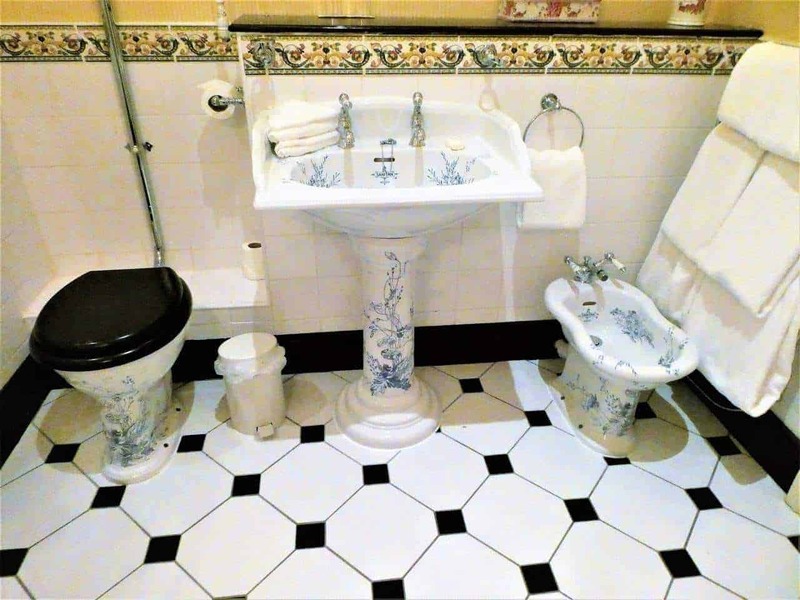 Similarly, our lovely, spacious bathroom included a bidet. Could we have been a visiting lord and lady in the Downton Abbey era… absolutely! For dinner, we sat in an opulent, yet intimate, period dining room. 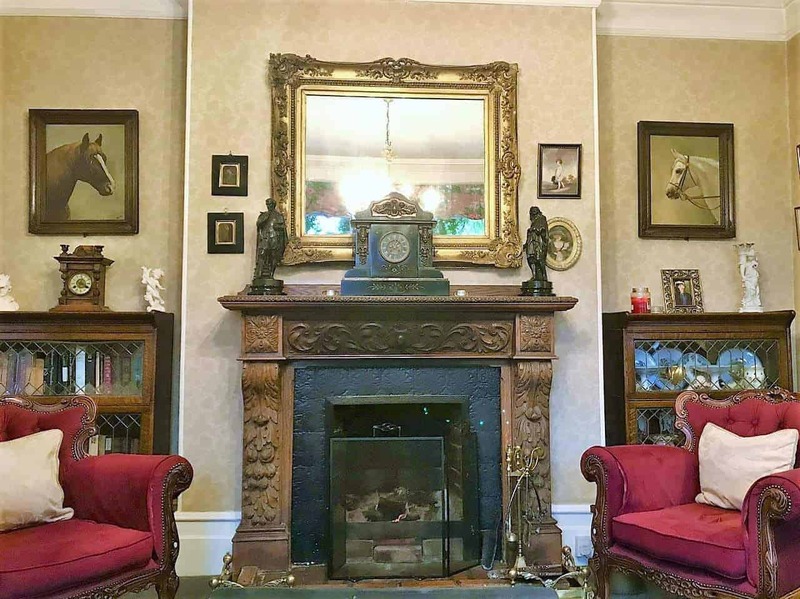 Antiques decorated the room while a fire crackled in the fireplace. 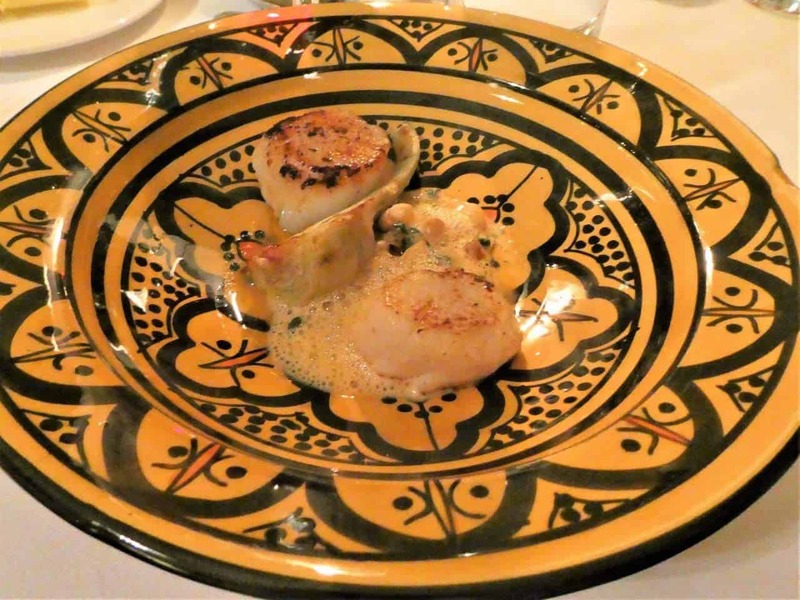 Our seven-course meal was a blend of French and Irish country foods. 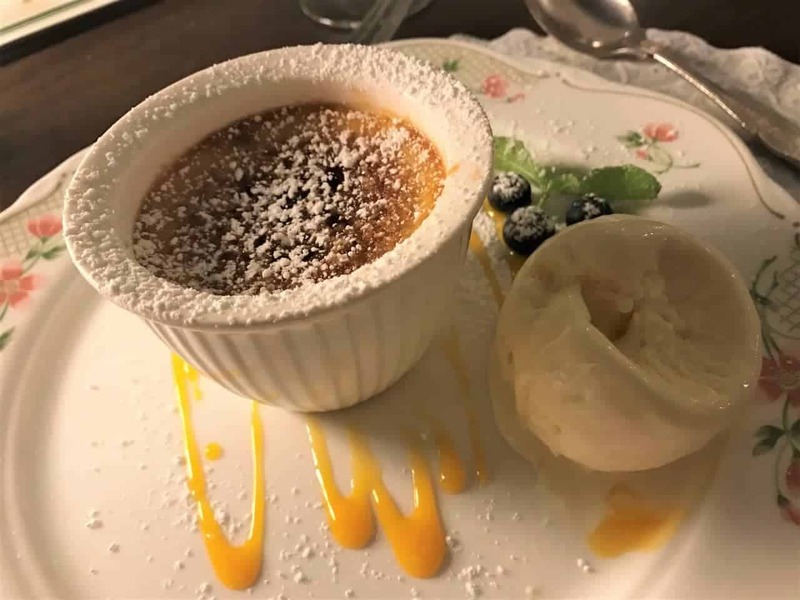 The chef uses only fresh, local produce, and organic ingredients wherever possible. Our next stay was in Northern Ireland, at The Bushmills Inn, in the village of Bushmills. Bushmills is very close to the Giant’s Causeway and why we chose it. It began as an old Coaching Inn and Mill House. The oldest part of the hotel dates back to around 1608 when ‘Old Bushmills’ was granted the world’s first-ever license to distill whiskey. Upon arrival, we saw an American flag proudly flying above the main entrance. Then around the corner, we noticed an Ecuadorian flag flying over the middle of the Inn. We were curious. 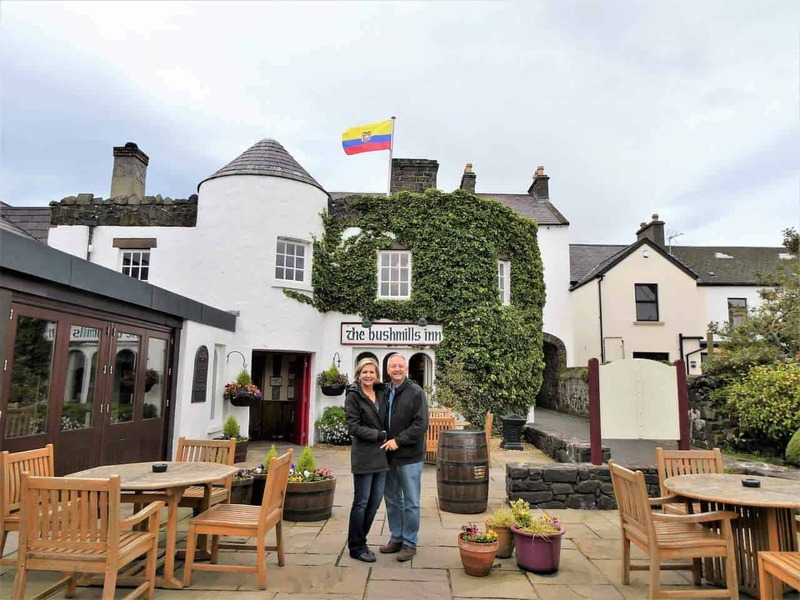 It is The Bushmills Inn priority to fly the flag of the guests who have traveled the farthest to stay with them. For those of you who may not know, Keith and I are Americans living in Ecuador. So the Bushmills Inn Flew both flags for us! Thus we were quite honored for ourselves and our home country the USA and our country of residence, Ecuador. At The Bushmills Inn, we stayed in a tower suite. Our room was spacious and luxurious. It featured a four-poster bed, a plump sofa, and a desk with a Nespresso coffee machine. Then there was the large, well-appointed, bathroom; it was almost as large as our room. 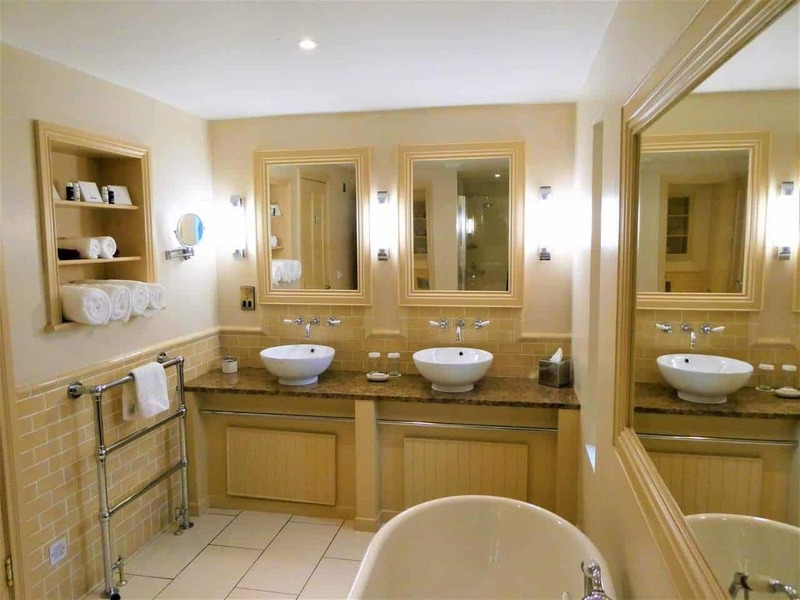 The bathroom with a free standing bath, large shower, and water closet contained luxurious toiletries. 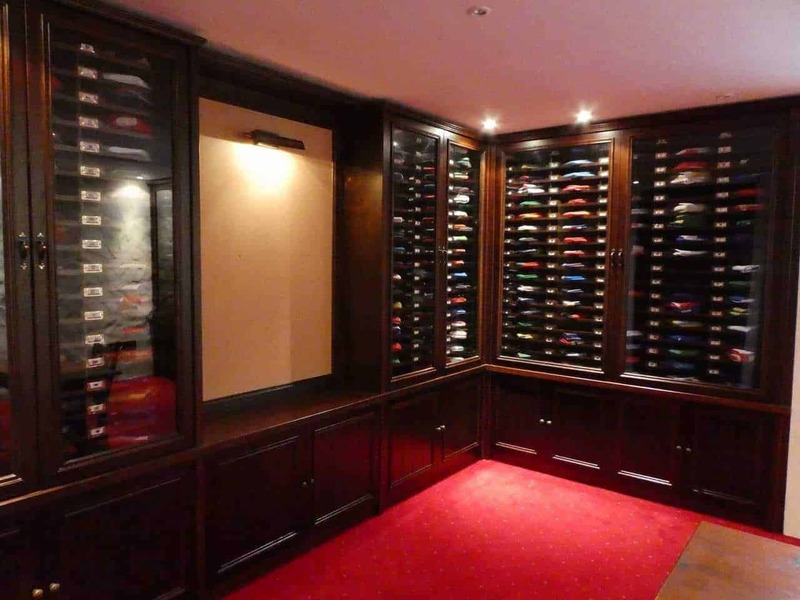 There was also a walk-in dressing room with a tea/coffee making area and where soft slippers and bathrobes hung. We wish we could have stayed here longer. Throughout the inn, there are many seating areas with peat fires blazing where you can read or enjoy a conversation. There is even a secret library room. While we were there, Nikki, the manager, and our gracious host gave us a tour of the flag room. It is not open to the public, but we got a private tour. It is an impressive room when you stop to think that they have a flag for every nation in the world. 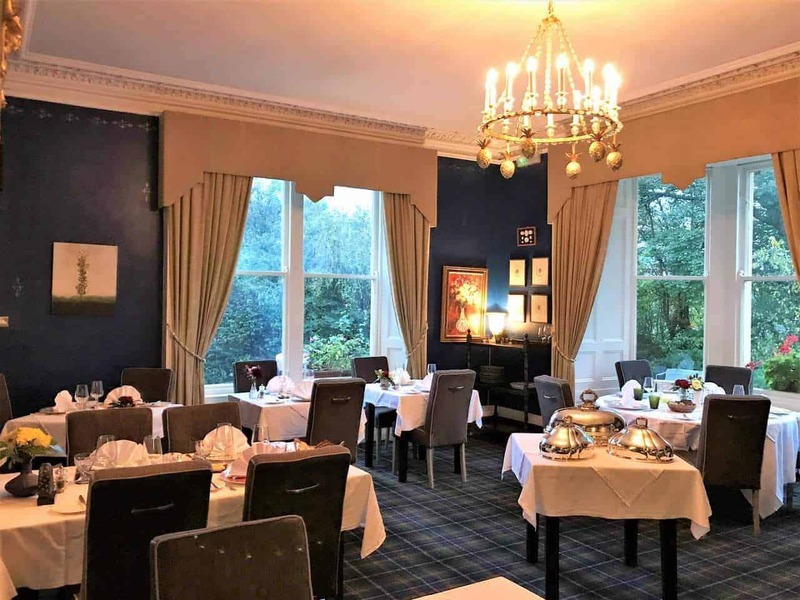 The Bushmills Inn offers many different dining settings in their restaurant. 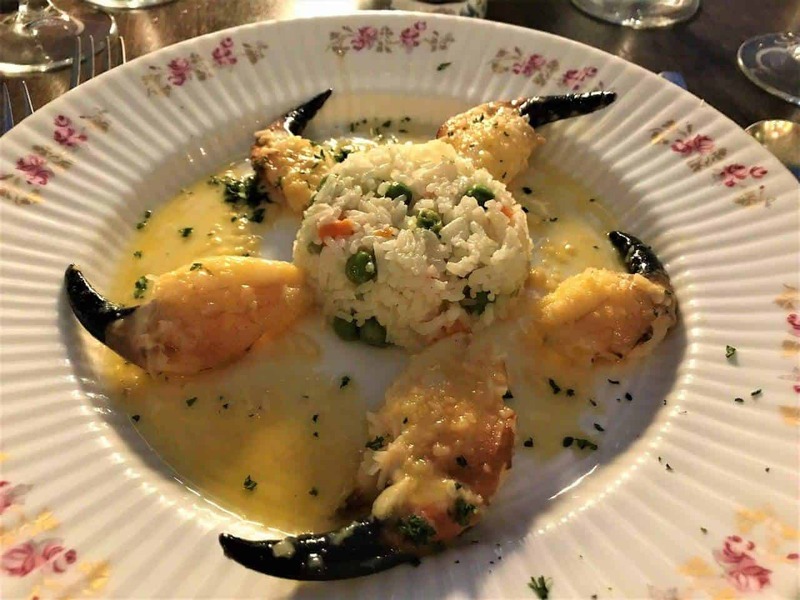 The restaurant sits in the original 17th-century stables and wine cellar. 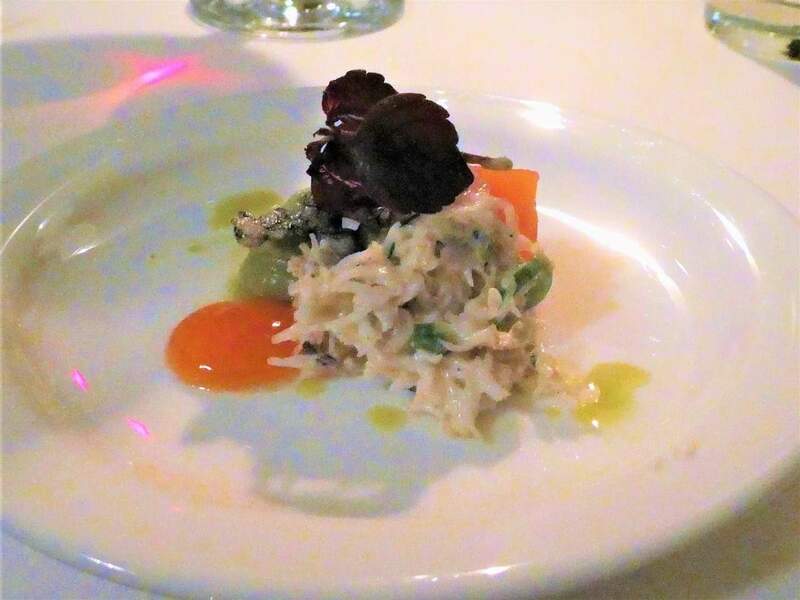 They use local farmers, fishermen, and local artisan goods to prepare their meals. 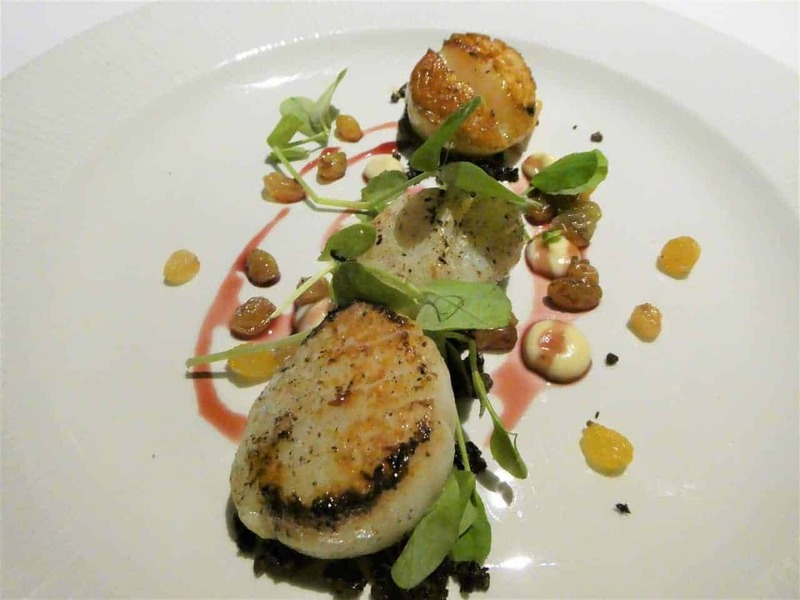 The food is outstanding, served with sophistication but without feeling stuffy or pretentious. For cocktails, they have a traditional gas-lit bar where you can have a drink fireside and enjoy live classic Irish music. Next up we stayed at Cashel House. 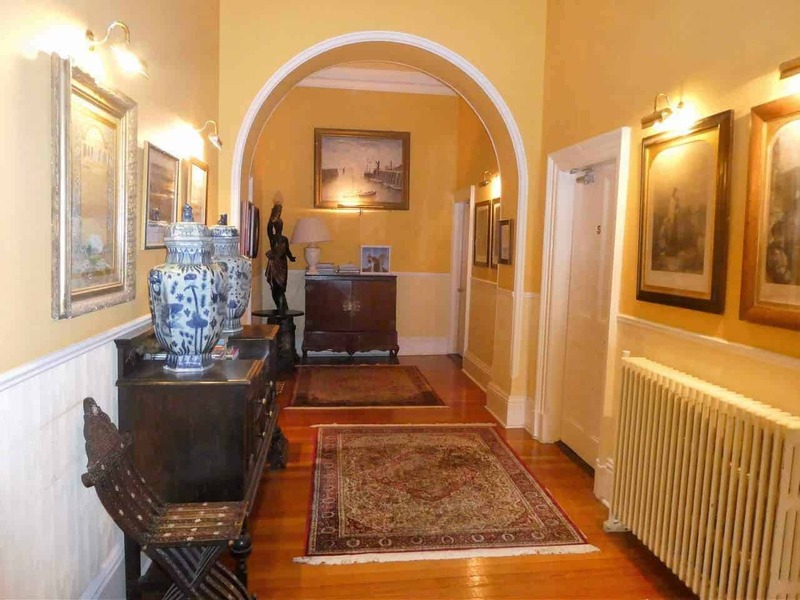 Cashel House, a manor built in the 1800’s is a great place to stay if you are exploring the Wild Atlantic Way. 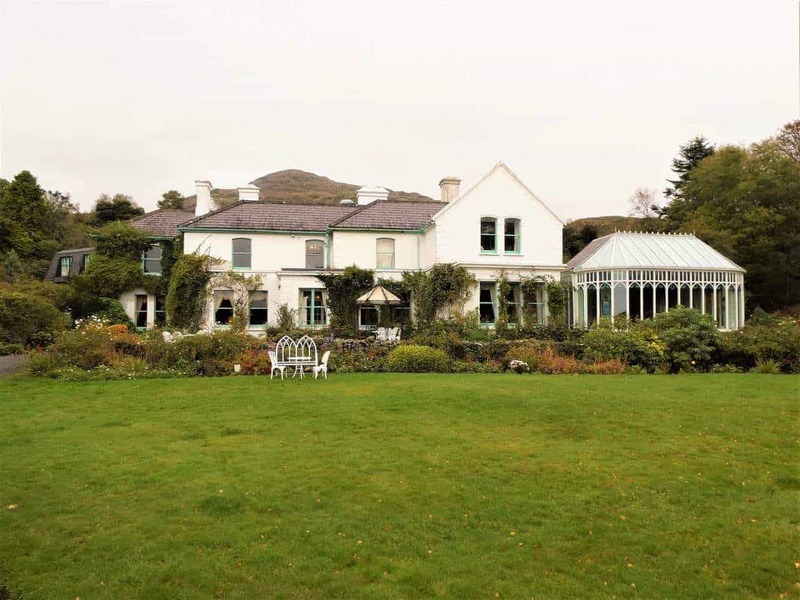 Cashel House sits on 50 acres of beautiful gardens and wooded areas along the breathtaking coastline of Cashel Bay. The all-white house cloaked in climbing plants enhances the beauty of the property. The same family has owned Cashel House for 50 years. Inside the country home, each sitting room feels warm and cozy. You will find turf fires burning throughout the day, and freshly picked flowers from the garden to welcome you. 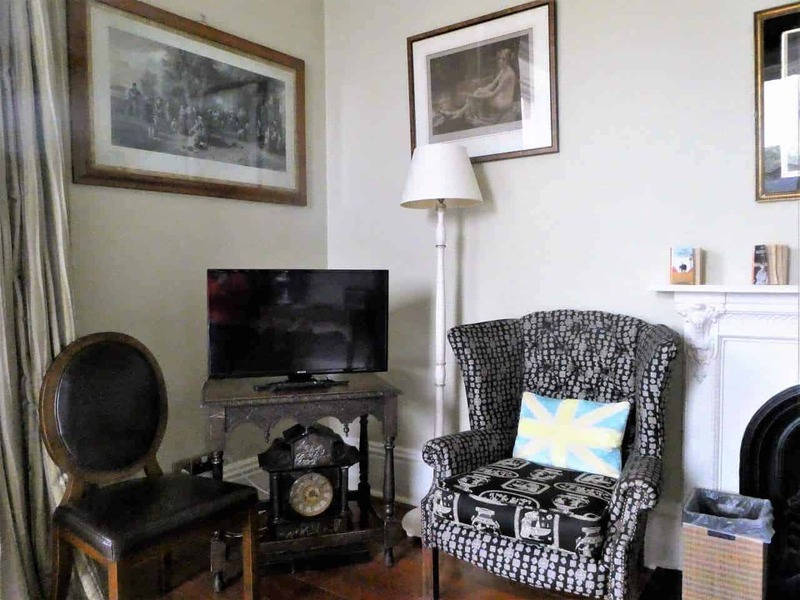 The historic day rooms furnished with antiques have walls covered with framed pictures. 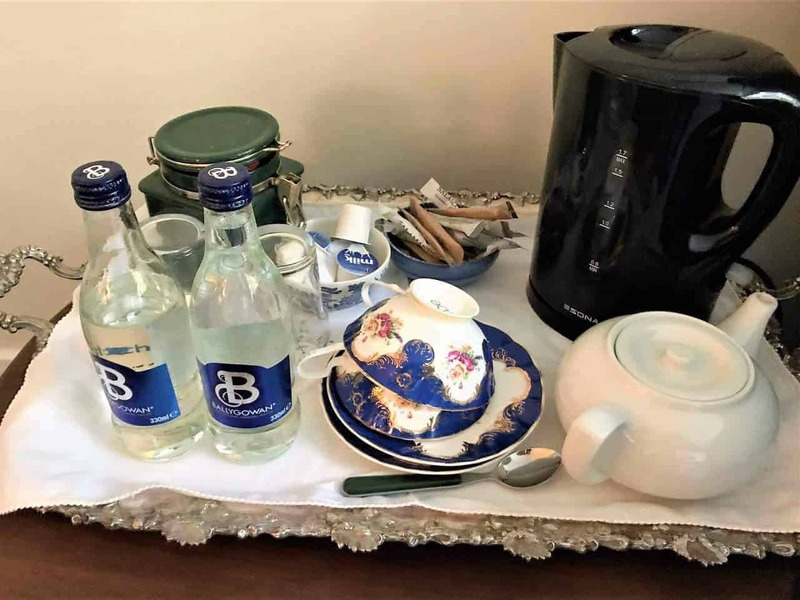 Cashel House is a great place to stay while visiting nearby Kylemore Abbey. 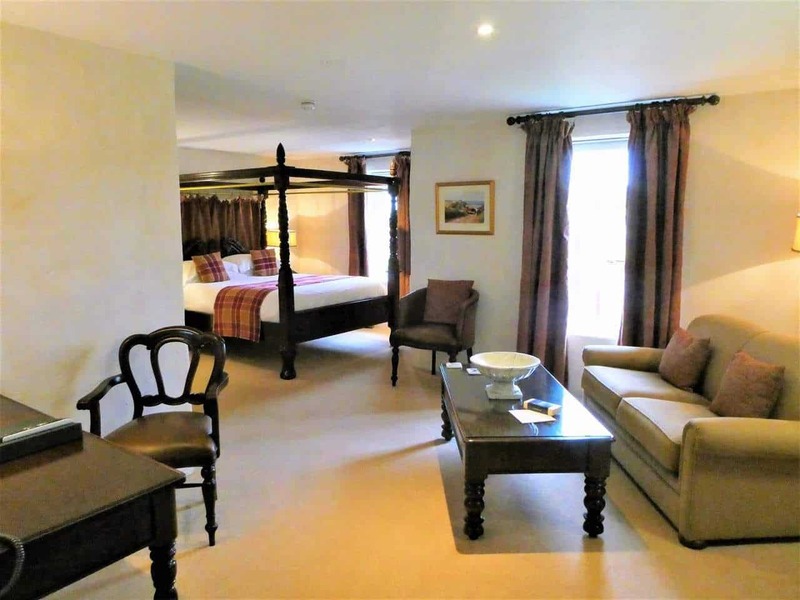 Our large garden suite room was a split level room with a step down from the bedroom to the sitting area. Consequently, it was a perfect place to view the garden. There was a beehive hidden in the garden, and we watched as the busy working bees flew in and out to make deposits. The service at Cashel House is impeccable. Rodrick is always ready to handle any special needs you may have. Cashel house also has a bar and Rodrick is the dapper bartender. The conservatory or main dining room overlooks the gardens. 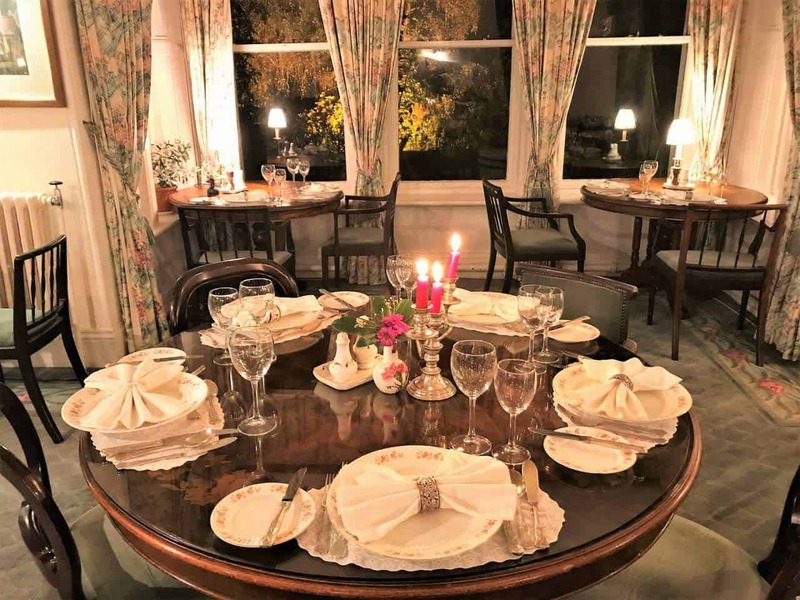 The tables are set with silver and linens as they would have been in the 19th century. Cashel Bay provides fresh lobsters, mussels, clams, scallops, salmon, trout and other seafood for the restaurant. Featured on the menu are also local meats and poultry with vegetables coming from their organic garden. We enjoyed our dinner at a window table viewing the lit gardens. Our four-course meal accompanied by family style vegetables and homemade Irish bread was amazing. 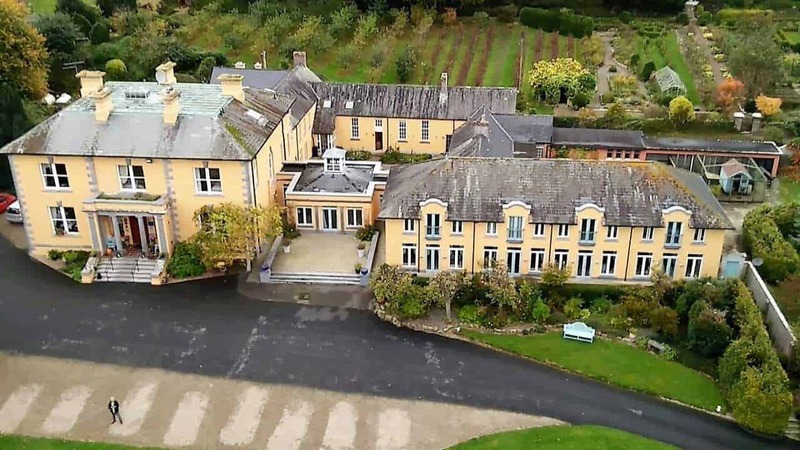 Nestled in the heart of the County Limerick’s countryside is where we found our last manor home, The Mustard Seed. It sits on ten acres of manicured lawns, orchards and kitchen gardens. The Mustard Seed is a converted 19th-century convent. In 1885 a priest built this parochial house with funds mostly raised in America. The priest then sold it to a group of nuns for a penny and a school formed seeing up to 300 pupils a year. The property went through a renovation and opened as The Mustard Seed in 1995. From the moment we entered the door, there was a sophisticated country charm that welcomed us. There are several common area rooms and hallways to enjoy in the Mustard Seed. All have a sophisticated decor but do not feel cold or stuffy, but rather they ooze charm. Upon entering the house, there is a square front hall, complete with a warm fire and sofa beckoning you to take a seat. There is also a cozy library with books and seating in abundance. Another warm fire awaits with a mantel adorned with thank you cards from happy guests. A cheery sunroom with a large table in its center covered with books and beautiful fresh flowers completes the house. We took full advantage of this room spending most of the following day here riding out the hurricane. I have a little story about check-in. We walked into a greeting of, welcome you must be the Paul’s. A short time later we learned that were the only guests in the house for the evening. She told us their other guests had canceled since there is a hurricane bearing down on Ireland. She said, “it is estimated to make landfall close to here, so we are going to be battening down the hatches.” We were so busy traveling and sightseeing that we were not watching TV or listening to our regular news podcasts. We were somewhat clueless that a hurricane would hit in the early morning. Our room at The Mustard Seed had large shuddered windows overlooking the front yard. The king bedroom was large and contained extra seating. The room was furnished with period furniture and little extras like magazines to make our stay homey. John Edward Joyce is the owner of The Mustard Seed. He was the perfect host during the hurricane serving us mid-morning tea, delicious soup for lunch and even before dinner wine. All the while battling the fierce hurricane winds trying to force open the front doors. We enjoyed dinner in the classy, vibrant dining room. The tables set with modern chargers and stemware were like lovely works of art. 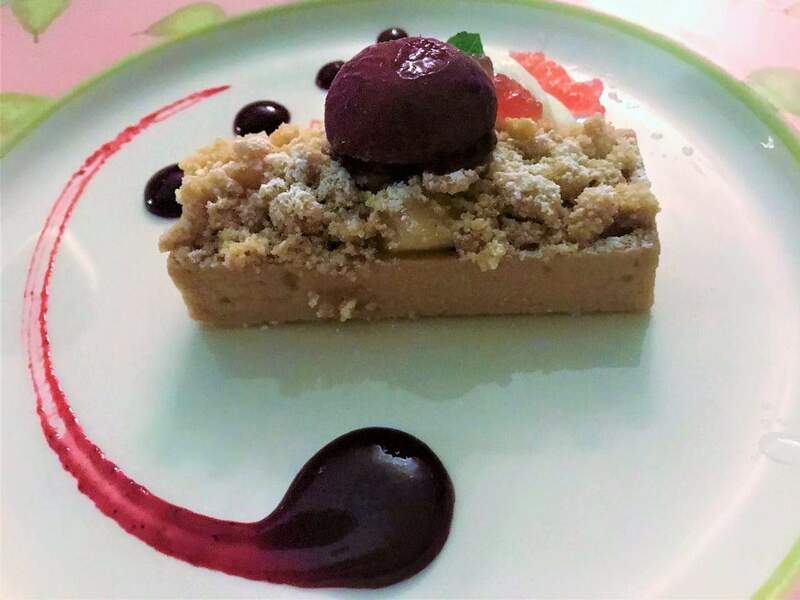 Our four-course dinner menu consisted of carefully created choices of seasonal foods. John Edward took our order and brought each course. 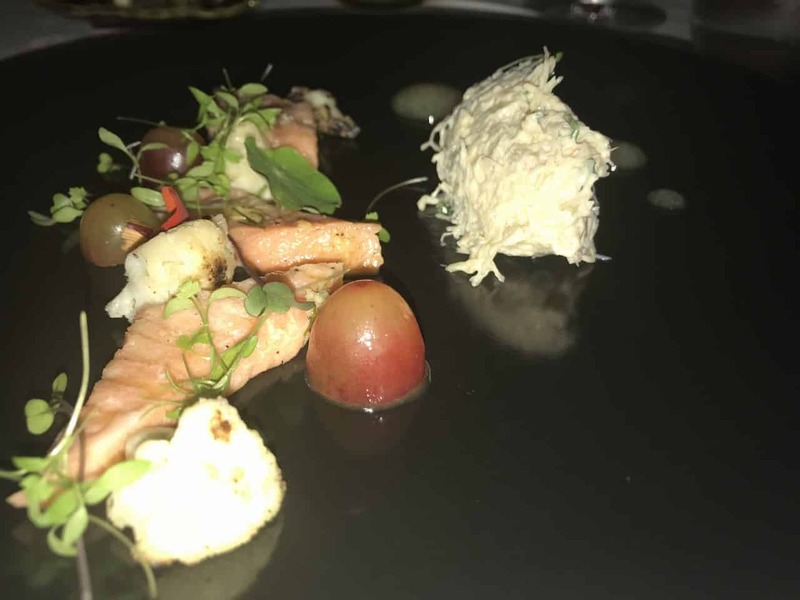 Therefore each course was well-presented. With a fast approaching hurricane on a weekday and we the only guests in the house, the dining room was bustling with people there just for dinner. 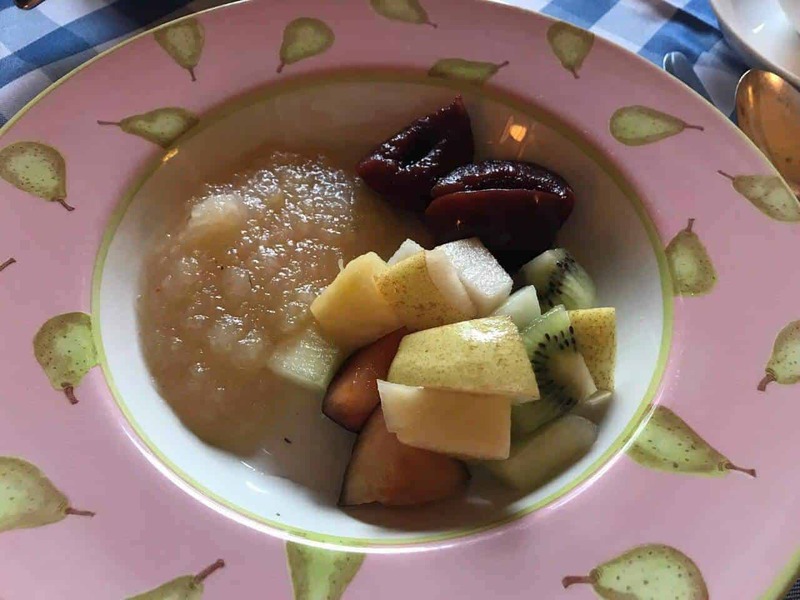 Each morning, our made to order breakfast started with fresh organic fruit and applesauce from the orchard on the property. As we pulled our rental car into the driveway of each of these manor houses and castles, we felt as though we had entered a storybook. If you want to experience a by-gone era with top-notch modern comforts and conveniences, then Ireland’s Blue Book homes are for you. Try living for a day, or two or even a week in an old world style estate home nestled amongst beautiful landscapes. Each one of these historic places is rated four stars. Ireland’s Blue Book has strict standards assuring you of an outstanding experience every time. Each country home we visited came with a beautiful spread of pre-breakfast delights waiting for us as well as a made to order breakfast selection. From check-in to check-out each accommodation had impeccable service. All the manor houses had a unique personality and charm making it worth trying several. Thanks for sharing this post, really interesting to read, with some classic photography. Thanks so much! I am glad you enjoyed the photos! You are welcome. Hope you visit Ireland soon! June, You are so welcome! I am extremely happy that you liked my photography! stay tuned for more travel adventures. Traveling is the most important part of anyone’s life which helps you a lot. Marvelous photography here !!! Thank you so much for the photography compliment. I so appreciate it as I aspiring to take better photos. We agree travel is important! Great Post, Keep up the good work! !